You tell us what you need the caster to do and we locate the right caster for the job - whether from our in-stock inventory or through one of our many manufacturer partners. From simple cart caster replacements to heavy-duty, high-stress performance for large towing vehicles, we've got the connections to the right caster and wheel maker to deliver the quality and reliability you want. 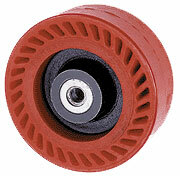 Let us help you in determining which caster and wheel fits best for your fabricated carts and hauling vehicles. We have the experience and know-how to get you connected with the right product for your product. A variety of resources, articles, and information to help you specify the correct caster, wheel, and bearing combination for your needs. We are always available of course, with local San Antonio caster experts to assist you.